The European Commission and some EU member states have raised concerns about France's 7.8 billion euro bailout for its auto industry. Germany is not happy about French support for PSA/Peugeot-Citroen and Renault, a senior government source said. "We need to ensure that no one gets a competitive advantage," the source told Reuters on Tuesday, speaking under condition of anonymity. "Nothing should be approved which contravenes EU support guidelines," the source added. Slovakia's finance minister Jan Pociatek said his country would ask the European Commission and European Council of Ministers to intervene if French state aid to carmakers proved protectionist. Pociatek criticized comments by French President Nicolas Sarkozy suggesting that French carmakers with factories in Central and Eastern Europe should move production back to France. "We were very disturbed by this statement," Pociatek said after a meeting of EU finance ministers in Brussels. The Czech EU presidency accused an inner circle of euro zone countries of breaking EU rules to shield their economies from recession. "The response of the euro zone countries to the financial and economic crisis deformed the joint project of the euro more than any other imaginable event," said Czech Prime Minister Mirek Topolanek. UK finance minister Alistair Darling said: "It is entirely possible and indeed desirable that countries support their own economies -- France and Germany are supporting their car industries and so are we -- provided that you do those things together." The European Commission has asked the French government to clarify details of the auto sector rescue plan. Commission spokesman Jonathan Todd said if the plan violated the principles of single markets, then aid "would be deemed to be illegal and the Commission would not tolerate that." On Monday, France announced state loans of 7.8 billion euros for PSA and Renault in exchange for pledges to keep jobs and assembly lines in France. 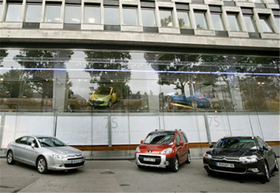 Each carmaker will receive loans of 3 billion euros over five years at an interest rate of 6 percent. The state will also double its aid to auto industry suppliers to 600 million euros to protect the entire sector from the global economic storm.